During the last three years Bansko"s ski area has beencontinuously improved with new four-man chair and drag lifts, a snowboarder"s half pipe facility, a fun park, and a floodlight ski run that allows you to ski all the way to the edge of the town. Other improvements include snow cannons covering more than 80% of the skiing area, extra maintenance vehicles to keep the slopes in the best possible condition and extra safety installations for the skier"s safety. Another reason why you should visit this year is because you get to witness the FIS Ski world Cup. 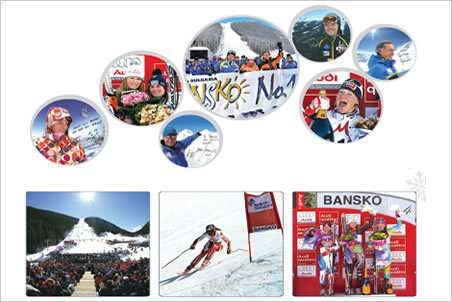 During the upcoming season Bansko will have the honour of hosting the FIS Ski World Cup Bansko 2011 event between 27 - 28 Feb. All Balkan Holiday guests of the resort will have the opportunity to watch this world class competition. Over the last decade the substantial investment in the ski infrastructure has transformed Bansko into the best ski resort in Eastern Europe. Due to all this Bansko has the honour of hosting the annual FIS Alpine Ski World Cup championships. Balkan Holidays is very proud to have been a part of this initiative. The modern Gondola takes you in comfort to all of Bansko"s 17 well groomed ski runs including the most popular "Tomba" run, named after the famous ski legend Alberto Tomba, and used mainly in the Ski World Cup of the FIS calendar and the Balkan Cup.